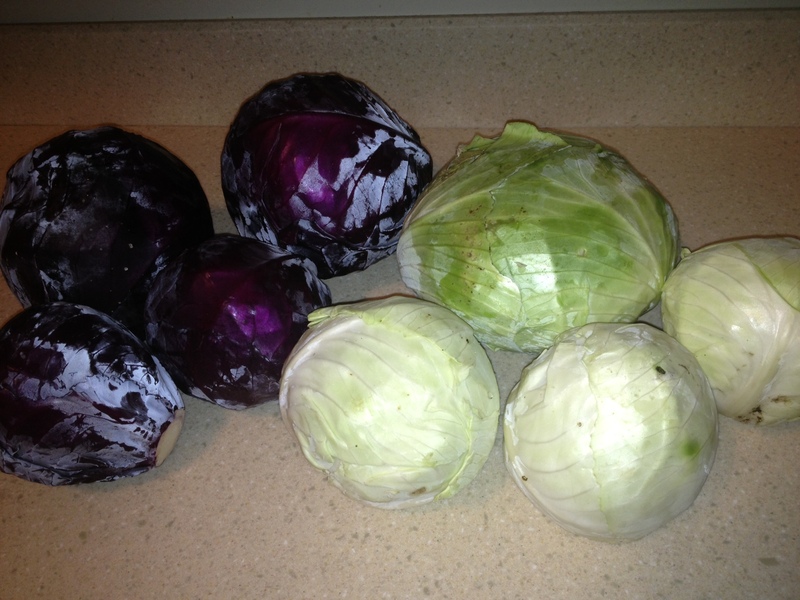 Amy’s garden yielded a pretty good cabbage crop this summer, so last night we harvested heads of purple and green and made sauerkraut for the first time. 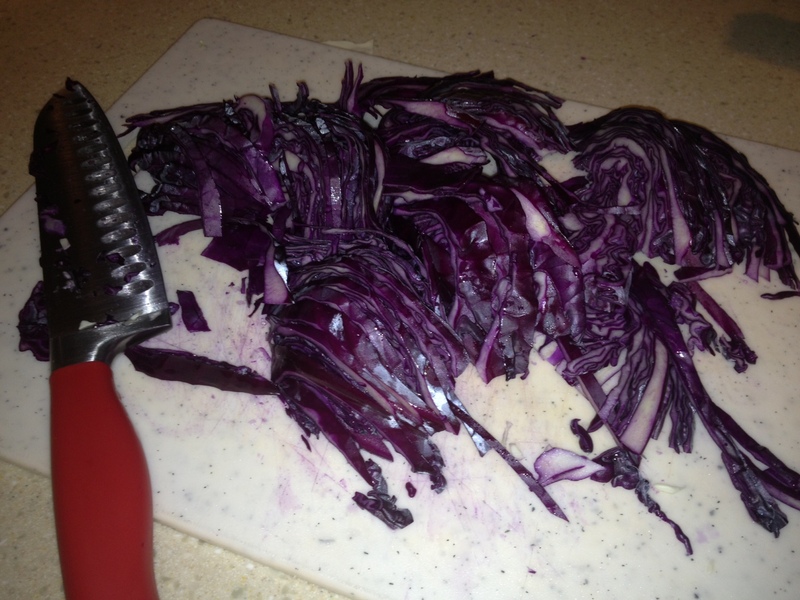 We used a simple kraut recipe – just shredded cabbage and salt. From Mother Earn News, here’s a recipe for simple sauerkraut. Grate 1 cabbage and place in a crock or plastic bucket. Sprinkle half the salt over the cabbage. Grate the second cabbage, then add it to the crock along with the rest of the salt. Crush the mixture with your hands until liquid comes out of the cabbage freely. Place a plate on top of the cabbage, then a weight on top of the plate. Cover the container and check after 2 days. Scoop the scum off the top, repack and check every 3 days. After 2 weeks, sample the kraut to see if it tastes ready to eat. The flavor will continue to mature for the next several weeks. Canning or refrigerating the sauerkraut will extend its shelf life. Yields about 2 quarts. Read more. While digging through the cellar I found some beautiful stoneware crocks that belonged to my grandma. I would have loved to repurpose these, but after doing some research we decided that it was best to purchase a new crock. The old ones had been setting for years in the cellar, the porous material absorbing who-knows-what and some searches we did warned that old finishes may contain lead. But we rescued the crocks, cleaned them up, and they are now decorating my kitchen. And on the counter sets a brand new Ohio Stoneware 3-gallon crock. We weren’t able to find a cabbage shredder, but my grandma offered a simple solution – a sharp knife – which worked well enough. This evening, I will carry the crock to the basement and cooler temperatures, then it’s just time to set back and let the cabbage do it’s thing. Hopefully, in two or three weeks we will have our first batch of homemade sauerkraut.